This is a game I had been anticipating since its announcement and after quite a long wait (almost 2 years since it came out in Japan and about 5 months after it came out in Europe), it finally came out in North America last Friday. Was it worth the wait? Completely. Whether you are only an Ace Attorney fan or only a Professor Layton fan, this game is still something you should be able to find enjoyment in (as long as you don’t hate court rooms and/or puzzles). The game does a great job crossing over the two series along with many ties to the original games and various staples you’ll be familiar with. I’m anxiously looking forward to getting to personally play the rest of the bonus episodes, but for now let’s get to the full review. 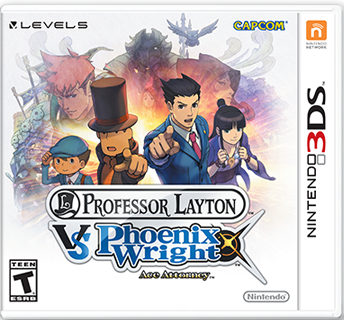 Professor Layton vs. Phoenix Wright, despite the name, is a much more of a team-up than a duel–at least until the end with a court battle that was familiar of Phoenix and Edgeworth working together even including Professor Layton having some similar animations to the magenta suited prosecutor. The game features a fantasy setting in a town called ‘Labryrinthia’ and is where nearly the entire game takes place. The playstyle is a mixture of both games with the exploration taking more of a Professor Layton Direction (with a bit of Ace Attorney mixed in) while the Court cases are, unsurprisingly, much more Ace Attorney-based with a few new features. While the game can seem like its much more a Layton game than an Ace Attorney game because of this, it’s actually pretty even. Professor Layton is a game that was largely inspired by the Ace Attorney series and it’s things like this where it really makes you realize just how much. While there isn’t the usual Crime Scene investigation for the most part, there are still a few times where you do find things (besides hidden puzzles). That said, I don’t think they could have made it more Ace Attorney style without there being a bunch of unneeded items to find… and even then, that is something the Professor Layton series has done as well (with the various collectibles you can find in some of the games). Both games feature looking around a screen and interacting for comments on them and/or to find a clue. And while initially these can come off as quite different due to the nature of them (Finding evidence in Ace Attorney versus finding Hidden Puzzles, Hint Coins, and sometimes things relating to Minigames in the trunk in Professor Layton), they still work very much the same. In the end, it’s not that the Professor Layton parts were more abundant and/or longer–it’s that there wasn’t as much as you’d expect to find in an Ace Attorney version of it. There were very few pieces of evidence you needed to find in the game (and for the most part, was prompted) so other than the occasional questioning a character through a series of questions you could pick from, it made sense there wasn’t as much that really made you think “Ace Attorney” over “Professor Layton”. I think one fix that could have helped is if they showed Maya’s abilities–we got to see Luke’s ability to talk to animals several times, but neither Maya’s Magatama or Spirit Medium powers (though, the latter is more understandable considering the plot) were given a time to shine and if we at least had the former, there would’ve probably been more evidence to find and more reasons for questioning various people, even ones who could come off as unimportant (versus just some random dialogue or another puzzle). That said, the game has a interesting (though, it can get… quite dark–which you may expect considering the series this is a cross-over from, but it still surprised me just how dark it went) plot and is full of all kinds of unique characters. Phoenix, Professor Layton, Maya, and Luke bounce off eachother seamlessly and I’d be all for more interactions between them (seriously, please make more crossover games). The voices are all pretty good, though, as a warning for other North American players, like in the Professor Layton movie, Luke’s voice was not redubbed in this game and has his PAL-region voice. Similarly, the game uses a lot of different spelling (such as defence versus defense) which while correct in other places will probably stand out and look a bit awkward. I was able to eventually ignore the spelling, but Luke’s voice had a tendency to throw me off more often than not whenever he spoke. The only other voice that stood out as a bit odd to me was Edgeworth’s through a cameo at the end of the game. Similarly, the music features new versions of various songs from both series including a few new ones. I would’ve liked to see a few more Ace Attorney songs used though outside of the court areas–another thing that I feel may have added to the exploration feeling too “Professor Layton”-based. But yes, as mentioned at the beginning even if you just like one of the games/only have tried one, unless you really hate a certain aspect of the other game, I’d highly recommend picking it up. Similarly, if you have been interested in both games, but haven’t had a chance to try them, this game is a great introductory to both series as well. And if you enjoyed both games, you should have no problem enjoying this game as it really puts together both wonderfully. Though, if you’re a Professor Layton fan, you should not be surprised to know they completely forgot Flora exists. Again. Regardless, I really hope they may actually do another crossover game between these two series. I just found the entire game really impressive (and honestly could be called one of the better games for both series) along with reminding me just how much I miss Phoenix teaming up with Maya.